American journalist and publisher; born at Albany Oct. 28, 1849; son of Isaac Mayer Wise. He was educated at St. Xavier College and Farmers College, Cincinnati; College Hill, Ohio; Trinity College, Hartford; and the University of Michigan (A.B., Farmers College, 1867; L.B., University of Michigan, 1869). In 1863 he served a brief term in the river flotilla of the United States navy, and in 1872 was one of the original prospectors in the diamond fields in South Africa, where at Dutoit's Pan he opened a new digging which was at first called "New Rush" and afterward became the famous "Colesburg Kopje," now in the Kimberley district. 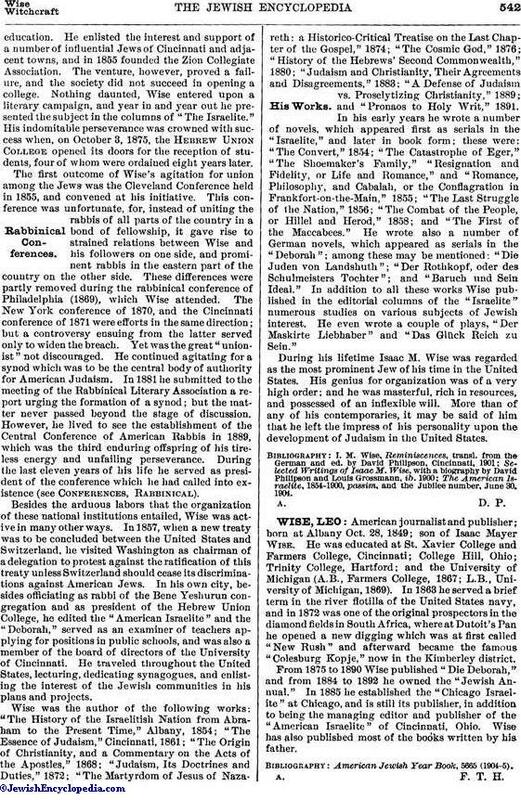 From 1875 to 1890 Wise published "Die Deborah," and from 1884 to 1892 he owned the "Jewish Annual." In 1885 he established the "Chicago Israelite" at Chicago, and is still its publisher, in addition to being the managing editor and publisher of the "American Israelite" of Cincinnati, Ohio. Wise has also published most of the books written by his father.